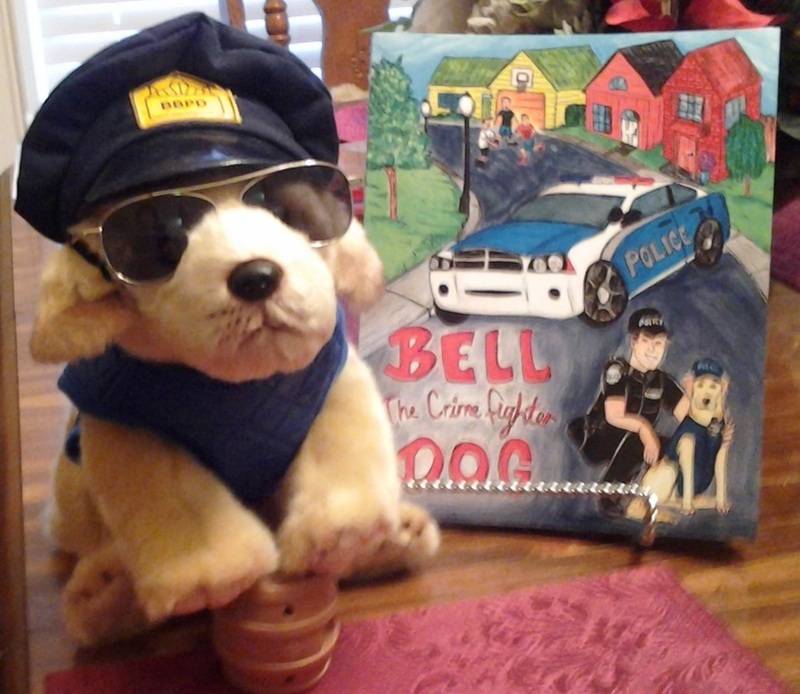 Bell the Crime Fighter Dog is the third book in the Rescue Animal Series of Books. As with Watkins' previous two rescue books of realistic fiction, the base of the story closely aligns itself with the real adventures of its lead character - in this case - a young Labrador pup who grew up as a stray and ends up being a very important part of the community in which she lives. A heart warming story about survival and second chances. This book shines light upon the situation of pet overpopulation, responsible pet ownership, and the great job animal control and shelters do in caring for so many of these animals. Also, the book opens hearts and minds to the fact that these animals have so much to give as companions, service and therapy dogs/cats, best friends, and sometimes real heroes. Being both educational and entertaining this book is a wonderful book to place on any child's bookshelf. The song "Everyday Heroes" is a great companion that pulls the meaning of the book into hearts with its tender lyrics. Sam The Dog Pound Hound is based upon a personal relationship my family had with Our Dog Sam, who was a hound my husband brought home from the pound. He was an older dog, very much in need of a home, and we were a family, very much in need of a family pet. What a wonderful member of our family Sam proved himself to be. He was a protector for our children, a companion to me, and a hard working ranch hand who worked alongside my husband each day. He didn’t have a pure bred pedigree, but he was pure in heart and as loyal as they come. If you are considering bringing a pet into your family environment, I encourage you to first check into the dogs/cats who are being cared for by your local animal control center and humane shelter. These animals desperately need homes and you just might find yourself a hero there, as we did with our Sam. Sophie The Shelter Cat is a delightfully light hearted entertaining story about a persnickety mischievous older Siamese Cat who is adopted by a family from the local humane shelter. In order to secure her place in her new family, she feels a need to contribute to family life. She'd always been good at catching mice, so she decided to rid the house of any mouse that might dare to make his way into the home. Little did she know that there was a daring little mouse who was already in residence and he delighted in playing cat and mouse games with Sophie. Then one day a near tragedy happens but Sophie springs into action and saves the family from harm. She ends up not only being the best mouse catcher in the county - she ends up a real hero. Cheese & Quackers are pet ducks who have become friends. They were both 'Easter Gifts' for children. Quackers family kept him, but Cheese ended up at a local shelter a week after Easter. Luckily for him, a shelter volunteer took him home to live with her and her family. These two ducks had dreams. More than anything, they want to fly South for the winter with the flock. They make plans for their trip. When the big day arrives, Quackers is too heavy to fly. He will have to make the journey by land. Cheese draws up a map for Quackers to follow. Quackers’ side kick, Minnie, a tea cup pot belly pig, makes the journey with him. Cheese's map ends up being an obstacle course as the two trek across the country, hiking, biking, boating, riding on horseback, and, zip lining off mountain tops headed South. Cheese & Quackers is full of zany fun-filled twists and turns along the journey where, in the end, both ducks do get to realize their dreams. The book resonates with the idea where there is desire and determination matched up with hard work – dreams can come true. Check out the companion Music CD (On The Wings of Dreams) - Musical Video Slide Show DVD - and Audiobook for extra options to go with this fun educational and entertaining story about shelter animals - animal migration - goal setting - and friendship. The Adventures of Cheese & Quackers comes 'with extras' in the form of songs, DVD Slide Show, and 'Audio Book' versions. I hear these two ducks are headed out West for their next adventure. Hello, I'm Donna and I love to write books. At first, I thought I would only write Cookbooks and Gardening Books, then, I challenged myself by delving into Children's Fiction. I found a bounty of stories to write about in my own backyard and in my community where I lace together truth and fiction to entertain and educate. I immediately thought about Our Dog Sam and what a blessing he had been to our lives. He was an older dog my husband brought home from The Pound, so I wrote about him. Then I wrote about a persnickety Siamese cat who shared our home. The Director of Animal Control shared the wonderful story about a dog who made her way from Stray to K9 Cop and it was an honor to be able to build a story from those beginnings. There are so many wonderful stories to write about animals. From the wild or family companions, the list is endless. You just have to unleash your imagination.